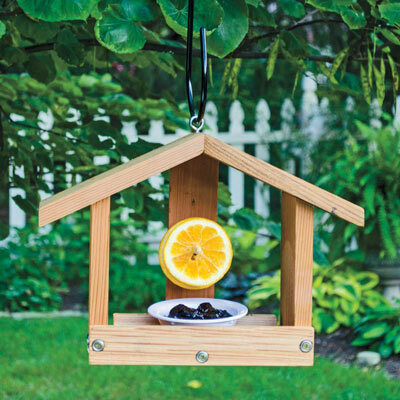 Durable fruit feeder attracts orioles and other fruit-loving birds! Here's a fruit feeder specifically designed to offer the two foods orioles simply can't resist — oranges and jelly! The cedar body is very durable and has an eye hook for hanging or mounting to a tree. This beautiful feeder comes complete with a dishwasher-safe plastic dish that can hold several ounces of grape jelly, a sturdy peg for fresh orange slices and a roof to keep the food, and feeding birds, dry. 10¼″ H x 14¼″ W x 5¼″ D.